Indulge yourself in the breathtaking ocean seascape serenity, modern design features, comfort and industry best service elements of the all new private luxury accommodation retreat that is Villa Aamisha, Candidasa, Indonesia. Seen enough? Check if we're available on your preferred dates..
Let us welcome you at Villa Aamisha in Candidasa, Bali Indonesia. Enjoy our modern design features, ocean seascape serenity, comfort and industry best service elements all our new private luxury accommodation retreat has to offer. The Villa showcases a perfect blend of high quality modern Western and local Balinese-Indonesian cultural ethos statements and ambiance. Our guests enjoy an environment in which they can unwind, relax and enjoy Bali, Indonesia in true style and comfort. Rates include exclusive use of the villa and team services including manager, butler, chef, all villa facilities and complimentary breakfast daily. 1 Villa, 4 huge bedrooms, infinity pool, multiple living spaces – luxury villa accommodation at it’s finest. All bedrooms have their own private bathroom, including a bathtub, separate shower and walk-in closet. Villa Aamisha has 180 degree stunning view of East Coast of Bali Spacious four bedroom villa, excellent full service, friendly staff and delicious meals everyday to our stay Feels like in Heaven! What can I say. My family and friends stayed at this villa during our wedding and their experiences had exceeded their expectations. In fact it had exceeded mine. The view was fantastic and the staff was attentive. They are so easy and fast to communicate with! The location is very quiet and the villa is very well maintained! Everything was exactly what they stated on their website. The only thing is if you plan on booking this villa, be sure to order food in advance. It is a bit secluded and it takes time for their staff to buy the food and it's understandable! Other than that 5 stars for everything. Thank you Simone and thank you everyone at Aamisha for making our stay memorable and welcoming. We will certainly be back in the future! The view was so amazing! The villa its self was great. Big pools, big rooms, great 3 dining rooms, and the hospitality was great! This villa is really beautiful and the service is to the last detail, not to mention the fantastic views over the sea. To get away to relax in Bali this villa is near Candidasa the ideal place! I originally stayed here with a mate in May and it’s so good we decided to come back again this November. I’m putting this review up a day before leaving and missing it already. As I said last time, the whole villa has been done out to a superb level, fit, finishing and furnishing is all superb. It’s spotless, the views are great and the staff working are fantastic in making your stay as comfortable as possible including the amazing chef who does some excellent food which of course is served to you by the guys and girls on site who make it a great experience. Big respect and credit to them for that - thanks very much for making it a fantastic stay again. Thanks again to everyone for a great stay, will hopefully see you again in the future! We had a pleasant stay. The villa offers quality services and a view of the sea that we never tire. 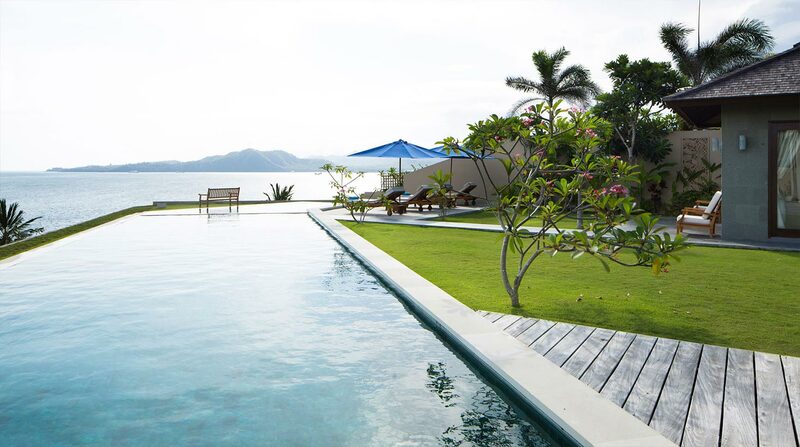 The spaces are spacious and the infinity pool is remarkable. The staff is very nice, helpful, attentive. We will keep an excellent memory of these holidays in Bali. Our stay at Villa Aamisha was the best one ever in Bali thus far. We loved how spacious and how tastefully designed the villa was! Not to mention, every room had a view to boast. Even the bathroom! Also, the service was just impeccable! 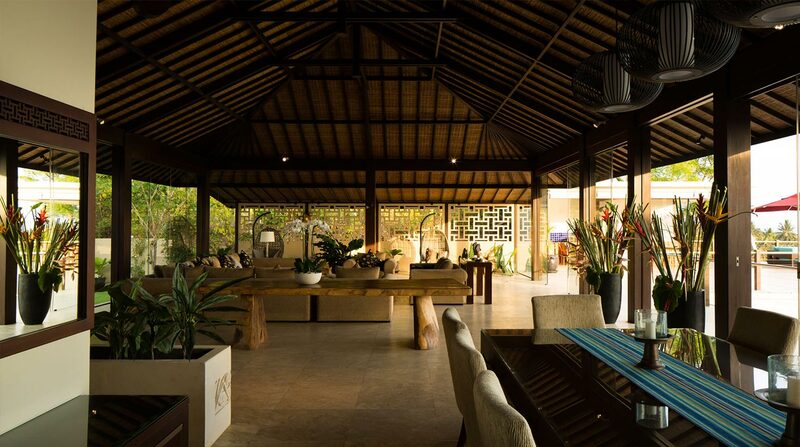 Compared to other villas in Bali, Villa Aamisha is never short of staff! With 3-5 staffs on standby at all times during the day, our needs were always met. Staffs had very good initiatives on checking with us on our needs. And Putu, was a very good cook! Our Villa Manager Gede, was also very nice to offer to buy us stuff when he was going out to Denpasar. Otherwise some of us would not have tried Naughty Nuri’s! Gede was also very considerate to recommend us only tours and massages that were value for money! The Villa was also spotlessly clean! We thoroughly enjoyed ourselves and will be back at Villa Aamisha if when we visit Bali again! We highly recommend t. In fact, many of our friends have been asking for the Villa’s name after having seen our pictures! The villa is in one word 'indescribable'. Not only in terms of location, but also in terms of ambiance and excellent service. The staff is very pleasant and immediately address your wishes and requests. The food is delicious and very versatile, chef Putu clearly has experience in both Indonesian and French cuisine. Tranquility, beauty and luxury. The infinity pool is gorgeous, but also the spacious bedrooms and living areas contribute the delightful experience. Guests can dine and relax in several areas on the premises, inside and outside. The staff makes sure its clean everywhere and the beds are tidy. The view over the bay is breathtaking. 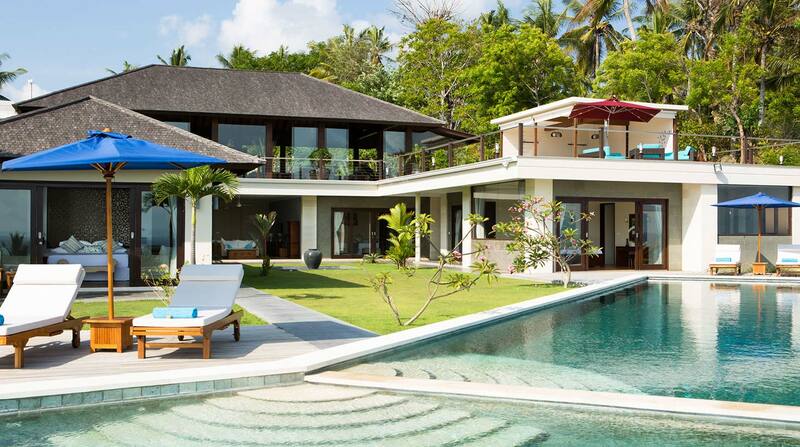 We already look forward to booking this villa next time we go to Bali!